For about six weeks I had the privilege of moving my several years old Sharp 32-inch 720p TV set out of my living room and staring at the shiny new Samsung UN46D7000 set up in its place. The Sammy is a 46-inch full 1080p HDTV with 3D capabilities, a 240 HZ refresh rate, and a slew of integrated Net connectivity bundled under the header Smart TV. It comes out of the box with HDMI, USB, and both Wi-Fi and Ethernet connectivity. My review unit shipped with two sets of 3D glasses, one featuring the latest in Bluetooth connectivity. It also came with an insane wedge of button-covered plastic that somebody, somwhere thinks is what a 21st Century remote control should look like. This TV also has a spec sheet that should impress people who like spec sheets. Highlights include an Ultra Clear Panel display with full 1920 x 1080 resolution, Micro Dimming and an 800 Hz Clear Motion Rate (whatever that means), 15,000:1 Dynamic Contrast Ratio, 240 Hz Refresh Rate, 4 X HDMI and 2 x Scart inputs, Anynet+ (HDMI-CEC) support. That's all fine and good, but honestly I all but forgot what this here appliance was meant to do the moment I got it unpacked and set up in my home. Then I just stared at the thing like a fool for a good three or four minutes, marveling at how much cooler it looked than the suddenly very old feeling set it'd replaced. Eventually, I gathered myself, wiped the drool from my sleeve, and turned the thing on. 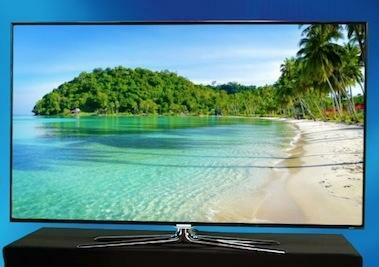 Samsung's 7000 and 8000 series of LED LCD and Plasma TV sets are absolutely stunning in design. The bezel on my 7000 was smaller than those I've seen on any other TVs, and what bezel there was was crafted from silver and semi-transparent acrylic that created a sort of invisible, sort of floating effect that, frankly, just looked really cool. Samsung's industrial design team is to be commended for coming up with a product line that appeals as much to the stereotypical dude ("I love me a big, bright TV! More football!") as it does to the stereotypical chick ("Honey? Sweety? Take that thing back. I will NOT have a five-foot wide piece of black plastic destroying my family room!") As much as any 46-inch diagonal screen can, the D7000 looked like a picture frame when turned off and an uber-vivid piece of artwork when powered up. And I didn't even get to mount it on my wall, where an "Omigod, that thing is so thin! It's like it's floating!" set like this really needs to be hung. I'm not a professional TV reviewer, and I'm not going to pretend to be one now. I do review consumer electronics for a living, however, and I've also been known to watch a fair amount of television. So I feel well qualified to tell you about the 46-inch D7000 in general gadget terms while leaving the specifics of black level performance, motion artifacting and backlight bleed to the HDTV experts. For what it's worth, I read several reviews of the set written by HDTV experts and they were all quite positive in general, while giving Samsung demerits for inconsistent backlighting and motion smoothing technology more often described as "annoying" or "artificial" than "helpful." Me, I can see what they're talking about regarding the backlighting, as particularly dark bits of content and all-black screens suffered from clouding – sections of white/light grey areas that appeared more brightly lit than others. As for the motion smoothing stuff? Let's just say that football games broadcast in HD looked great, but episodes of The OC on DVD suffered from mind-alteringly strong "Spanish Soap Opera Effect" until I figured out how to defeat all – or at least most – of the motion smoothing controls. Apparently TVs of the present are built with fast action movie scenes of the future in mind; if you want to watch dramadies from the late '90s you've gotta figure out how to dial your set back to "old shows shot in SD." I tried calibrating the set using settings I found on AVSForum, but quickly got lost in the dozens of picture control settings that are separately adjustable for each of the D7000's four HDMI inputs. I wound up going back to the out of box default settings, turning off motion smoothing, and making minor adjustments to a few settings like brightness and backlight. From there, I watched a whole bunch of TV. I watched 720p and 1080i broadcasts routed through my Xfinity cable connection and TiVo HD box. I watched DVDs and Blu-rays via an HDMI-connected Philips Blu-ray player. I watched local, locally streamed, and Netflix/YouTube video through an HDMI-connected Apple TV (1st Gen). And I watched Hulu Plus, Vudu and a sampling of other stuff using Samsung's integrated Smart TV hub. All in all, watching some tube on the D7000 was really good – once I got rid of that Spanish Soap Opera nonsense. I did notice some stuttering here and there during fast action sequences (mainly during sporting events), but I also noticed that it didn't take long for me to totally lose track of which picture settings I'd fiddled with on which source input, so I can't fault the TV outright. I'm 100% sure that the experience would have been significantly better had an expert come and calibrated the machine for my viewing area. And I'm 99% sure that there are other HDTV panels on the market that offer objectively more accurate and subjectively "better" reproduction of source material. But this set was bigger, brighter, and offered up more pixels than my old Sharp, and – I'll say it again – it's a gorgeous piece of kit to boot. The included remote is an utterly absurd, overengineered exercise in frustration. 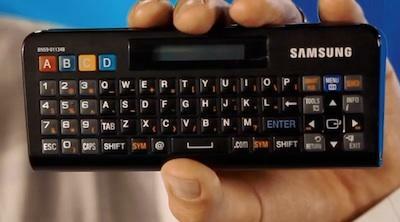 A mammoth, ugly wedge of plastic covered in countless buttons on both sides, the device is meant to provide a "normal TV remote" on one side and full-functioned, QWERTY-and-touchpad Smart TV remote on the other. Instead, what I experienced was a space and battery hog that couldn't control my TiVo box like my outdated universal remote can, backed by a thumb keyboard that was compatible with some Smart TV applications but not all of them. As a result, I programmed my old Logitech Harmony to control the TV set, since it also controls the TiVo, through which I can access Netflix and YouTube content. Samsung's Smart TV implementation, on the other hand, is really well thought-out and easy to use. 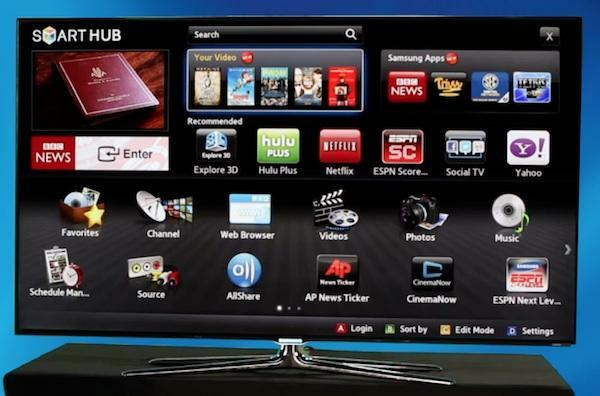 Offering perhaps the widest array of Net-based content of any Internet-enabled TV currently on the market, Smart TV encompasses streaming video services like Hulu Plus and Vudu, TV-formatted Web info like BBC News and USA Today, and a smattering of apps including video games and access to social networks. Personally I didn't have much interest in the split-screen, wrapped, and picture-in-picture content that let me tweet while watching TV or browse ESPN news while watching a movie, but for those who'd rather do it all on one big screen than wield a smartphone while the TV's on, Samsung's Apps were generally well designed and executed. I mainly enjoyed the all-in-one convenience of being able to switch from cable to BluRay to online video from YouTube, Netflix, etc. without having to fire up a second device (especially since this set takes it's sweet time recomputing the picture when switching between video sources). Generally speaking, the user experience of these services on the D7000 was on par with Apple TV, and just ahead of Vizio's offerings, as the best I've tried on a "Connected TV" platform. As for the set's 3D performance? I'm really not the guy to ask. For whatever reason, my 20 Mbps down cable modem was never able to make the "Explore 3D" app happy, so I can't comment on Samsung's streaming 3D service. I watched some 3D content via Blu-ray and it worked. The newer, more expensive pair of glasses Samsung sent me were very lightweight and comfy, though they had a tendency to distract me by reflecting various things around the room into the corners of my eyes. But I'm just not a big fan of putting on glasses to watch TV in my house, nor am I all that compelled by 3D content. Maybe I haven't done it right yet, I dunno. Those expert sites I checked said the UN46D7000 handles 3D content very well, so let's take their word for it, shall we? And oh yeah, the speakers on this thing actually sound good. Honestly, I was expecting nothing given how skinny the set is. But I never felt the need to route the sound through an external amp, except when I expressly wanted to enjoy surround sound though multiple speakers (which, frankly, I'm kinda over except at the theater). So let's see … Great, if maybe not perfect, picture quality? Check. Comprehensive and well-executed Web services? Check. Remote that I'll never use? Check. 3D support? Check. Absolutely stunning design that, honestly, just about outweighs all of those other factors in my mind? YOU BETCHA! I'm sold. Seriously, how much should my opinion of a $1,600 TV's plastic frame actually matter? That's for you to decide. Me, I'm pretty into industrial design these days, so the barely-there floating acrylic bezel scored a ton of points with me. Combine that with a really good picture, surprisingly good audio, and a million and one ways to view Internet-based content without plugging in more boxes, and you've got yourself one heck of a TV. Or you will if that price is okay by you. There are plenty of good quality 46-inch 3D HDTVs out there for several hundred dollars (or more) less than the UN46D7000. Thing is, none of them look nearly so nice when they're turned off.